As most of you know, I love animals. And as most of you also know, I am pigeon toed. I've decided to merge these two elements of my life by running (in my hilariously pigeon-toed manner) in a 5K to raise funds for the ASPCA, who work tirelessly to prevent horrendous acts such as cat juggling (www.youtube.com/watch?v=1bGVT4-1DBU). 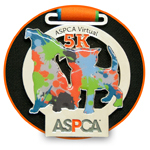 This event is a "Virtual 5K." No, this does not mean that I can only pretend to run from the comfort of my own living room while wearing a silly headset. It just means that I don't have to participate in some large, public event with countless athletic people boasting perfectly aligned feet. With the Virtual 5K, I get to complete my 5Ks on my own time, in my own way, as long as it is between June 1st - 20th. I could even walk around my block 467 times if I so desired. But, being the brave soul that I am, I have chosen to shrug off my severe aversion to physical exertion and actually RUN the 5.2-K path in nearby Prospect Park in Brooklyn. It won't be easy - this will be the first time in my life that I have run more than a K. Also, people will point and laugh at the big pasty sweaty hairy guy with funny footwork who collapsed after only 1/4th of a K.
Yes, it will take lots of courage. And it will not be a pretty sight when it's over and done with. But I care so much about my four-legged, winged, and/or finned friends that I'm willing to do it. I hope you will reward my courage and support this epic tragicomedy by giving to my campaign. Your generous donation will help the ASPCA provide life-saving programs and services to millions of abused and homeless animals nationwide. Thank you, and may god have mercy on my silly, mal-aligned legs.